I got my first royalty check this weekend. Actually, it was a notice in my email. It wasn’t a lot, but it was a royalty for a book I’d written and published. How cool is that? Summer is the slow month for my other business, the one that helps pay the bills (lapidary), so there won’t be any celebrating by blowing the check on something trivial, not until sometime around my birthday. I can kill two birds with one stone then. I got a royalty check! Also, I must put up a link to my website. Both books are there and all the places they are for sale. Have a look around, buy one if you’re so inclined. Let me know what you think of the website. Comments are always welcomed. Ahhhh, the weekend. Time to line up all the things I need to do next week. Right now, I’ve got a brand new WIP, the 2nd book in The Wildblood series. Naturally, it doesn’t have a name yet, but I do have a few lines for you. You can stop by WeWriWa and find a plethora of authors with previews. Now, my 8. 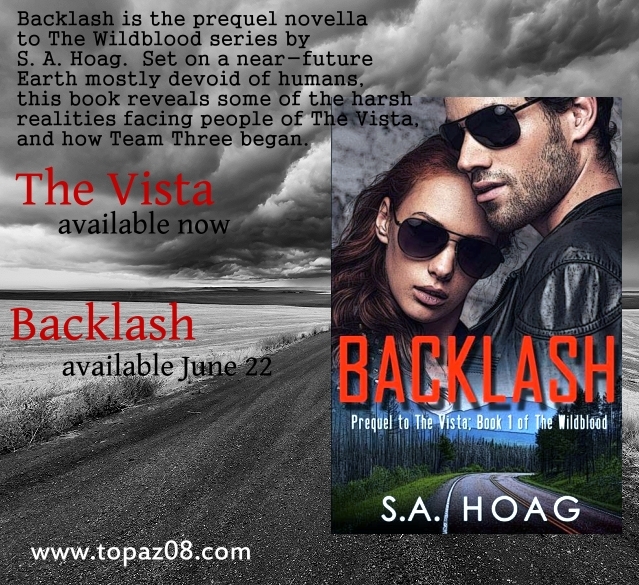 Below are links to Backlash, the prequel novella to The Wildblood series, and The Vista, which is Book 1. Comments are always appreciated. Enjoy your weekend! Before Team Three was Team Three, there was The Blackout. There’s something dangerous, out beyond The Vista, and it’s watching them. Ah! It’s that time again, for a SFFS post. First – the blog that started it all. Go have a peek. And now, a few lines from my WIP. It’s the 2nd book in The Wildblood series and I expect to have it out in December, 2015. It doesn’t have a name yet, just Book 2. “This is one of three air bursts,” Vance said, pointing to the video monitor. It was aimed east twenty miles and recording. Wade would look at it later. The grouping of buildings was isolated and more than that, destroyed. Melted, irradiated, and nothing remained that looked like it had ever been occupied by a human being. “Rocky Flats,” Shan said carefully. There were no ghosts, no remnants of the past, crowding into her thoughts. She was glad for that, having firsthand experience with a nuclear detonation. This place was . . . null. The prequel novella, Backlash, is available now. Because it’s a new release, I have it listed at Amazon for 99 cents, for a limited time. The Vista (Book 1) is also available at Amazon. Both are available at other retailers – check out my website for those links. Promotion is the word in self-publishing, and if you want to catch the reader’s eye, in addition to a great story, brilliant blurbs, and an amazing cover, you need some spiffy promo material. I spend a lot of hours on stock photo sites, seeking out possible cover material, and that spiffiness for promos that just begs “Read Me”. Of course, it has to be tied in to the story somehow, and not cost half my publishing budget. When I finally get something, I’m happy. It’s not the same rush as finishing a book, but it’s a pleasant thing, to get something accomplished. Especially when a novel takes months. So today I’m going to share my two newest promos, all linked up to Amazon, because I’m rather proud of the progress my photoshopping skills have come in the past year. So, here they are. It’s Here – 12 Hours Early! Backlash! Before Team Three became Team Three, there was The Blackout. Vista Security is used to the feral bands of human wandering the landscape since a brief and devastating war wiped away civilization. Sixteen years later, they’ve adapted to dealing with the challenges facing their safe haven. That is, until a new threat appears, one they never expected and one they have little defense against. Security throws in everything they can muster; it quickly takes a toll. Their advantage – an untested team of officers barely more than children themselves; officers with dark secrets and a hidden agenda. In a free-for-all battle to preserve one of the last sanctuaries of man, Team Three discovers their secrets are their strength and that their future will take them far beyond what they’ve ever known. Action, a bit of romance and a good splash of sci-fi set the scene for Backlash, the prequel novella of The Wildblood series. Ah it’s that time again! Check out the WeWriWa blog for lots of fun snippets. And now, my 8. A bit from Backlash, to be released June 22. Wade paced the asphalt, trying to sense what happened a day earlier. He was aware exactly what had taken place; seeing it for himself would help him to pick it apart and analyze it as he could. Even with the entire team there, he was drawing a blank. Ghosts more often happened at random and only rarely they’d been able to sense events deliberately. Taylor shadowed him. It was his job – not regular Security, but the one he’d taken up with being Wade’s right-hand-man. He provided back up and occasionally an alibi to cover covert things that others might stumble upon. Gen En things and civilians didn’t mix. You can find all my books and WIP snippets at my website or go right to Amazon link for The Vista. Just click on the cover. I just got the formatted version of Backlash! I’m in awed silence that my timetable for getting this online is actually working out. So, overnight Sunday, it will go live on Amazon for its Monday release date. It’s only been a little more than two months since The Vista went online, after years of procrastinating, messing with publishing houses, and wondering if I knew what I was doing. What a year this has been. I’m also certain I know about 1% of the things there are to know about epublishing. But I did it, and will continue to as long as I have a story to tell.